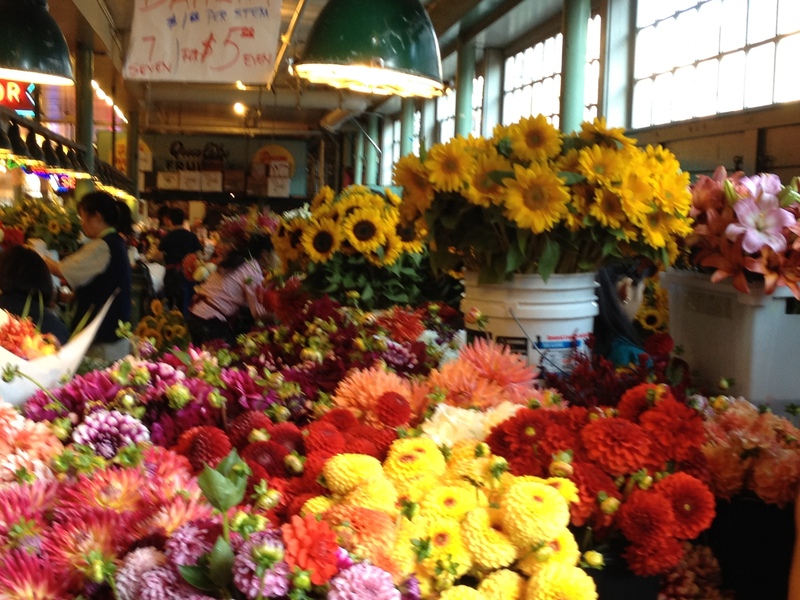 On a recent visit to Seattle, the highlight was my morning at the 105 year old Pike Place Market, home to more than 200 year-around businesses, as many arts and crafts booths, and 100 farmers who rent table space to sell their produce and flowers. 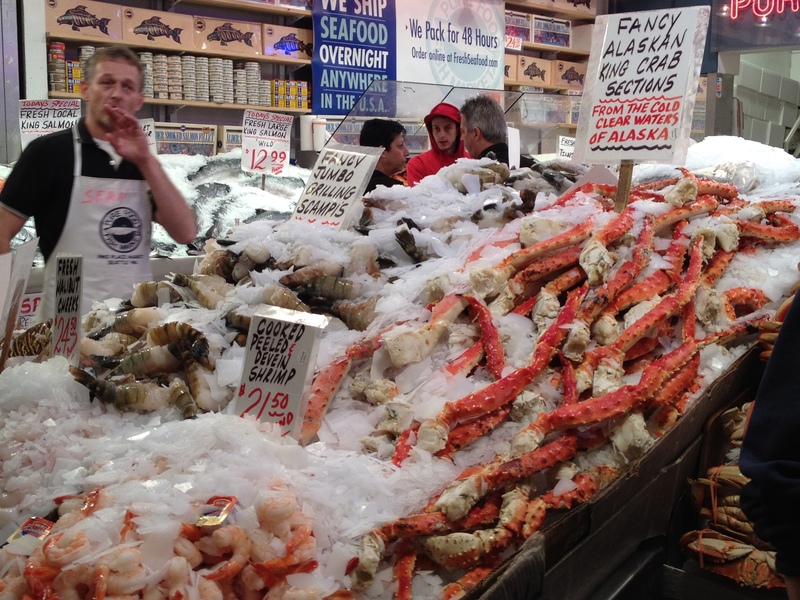 The Pike Place Fish vendors are popular not just for their abundant fresh seafood, but their comic and theatrical antics for their patrons ! The setting is on the edge of a steep hill overlooking Elliott Bay, home to the new Big Wheel, the ferry terminal, and the cruise ship docks. 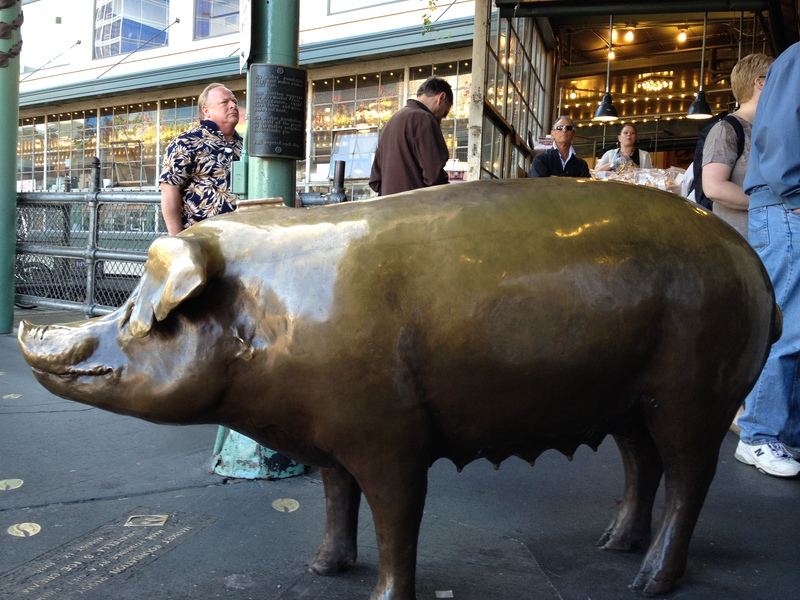 At the corner of Pike Place under the “Public Market Center” sign, sits Rachel, the unofficial market’s mascot. This bronze cast 550 pound piggy bank receives $6000-$9000 annually, which is used to fund the market’s social services. Seeing Rachel reminded me of Florence’s Mercato Nuovo, a.k.a. the ‘Straw Market’ which dates back to the 11th century. Most Florentines actually call it the Mercato del Porcellino, or “Market of the Little Pig” after the bronze statue of a wild boar (very common in Tuscany). Do you recall when Sir Richard Branson unveiled SpaceShipOne…the world’s first private spaceship which flew high-altitude flights in 2004? And that was followed in late 2009 by SpaceShipTwo. And more recently, during the 2012 Farnborough International Air Show, Virgin Galactic announced LauncherOne, a new air-launched rocket specifically designed to deliver small satellites into orbit. The company plans to offer commercial flights by 2016. For more information on Space Tourism, click link below. I still have quite a few journeys to take on earth yet, so you will not find me in the queue for a space trip any time soon. How about you? Vancouver, British Columbia is a pedestrian’s dream city. Walkers, joggers, cyclists, roller skaters all share the extensive well paved trails throughout this coastal city. The beautiful Stanley Park consists of 1000 acres of trees, beaches, play and picnic areas, a huge seaside swimming pool and a 5.5 mile walk-or-bike seawall path with mountain, water, and city vistas. On my recent 3 day weekend visit we started each morning out with a brisk walk on the Stanley Park seawall. Sea lions bobbed in the water, pleasure boats and freighters dotted the seascape, while the heavily wooded park on the interior of the seawall, offered facilities for outdoor pleasures. A visit to Granville Island (via water taxi or bridge) is a must, to enjoy the bustling Public Market, where local food vendors and artisans peddle their wares. Granville Island is also home to an array of arts-and-crafts studios and galleries dedicated to local and regional work….’the broom’ shop was rather unique I thought, as was the ‘ wooden boat maker’s’ shop, just to mention a few.